The Acura RL was introduced in 1996. It remained in production up until 2012 as it was a very popular car. 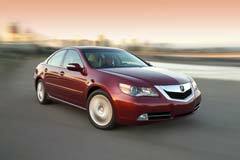 In fact it is quite easy to find a used Acura RL for sale. The Acura RL is a luxury sedan and it comes in a 4-door version. The first generation was the Acura 3.5RL with a 4-speed automatic transmission. The second generation kicked off in 2005. This is referred to as the Honda Legend. Through the years various upgrades were introduced, including new color schemes, larger navigation system screen, integrated fog lights and new alloy wheels, amongst others. The 2005 version is considered as a sophisticated all-wheel drive when compared to previous models and other brands. It also features improved handling, a keyless entry system, Bose speaker system, DVD-based navigation system, Satellite radio with integrated Bluetooth, wireless phone and other electronic features. An Acura RL will make a great car for most buyers. 2004 RL 4dr Sedan w/Navigation System 2004 Acura RL, Satin Silver Metallic with 130050 Miles available now!